Shepherd Autrey is a Quaker, a physician, and a man deeply disturbed by the madness around him as the War Between the tates bears down on his America in 1863. Dared by a friend to take an active role, Shep volunteers to provide humanitarian aid to the victims of Sherman’s scorched earth campaign in the Shenandoah Valley. There he runs foul of a Confederate recruiting drive and fi nds himself hanged by the neck from a tree. Awakening in a strange land which can’t possibly be earth, Shep is plunged into battle and saves the life of an alien warrior prince. Hailed by bloodthirsty killers as the bravest man alive, Shep combats his conscience, his fl agging faith, and an ever-growing number of people who want him dead. We will send Peace Lord of the Red Planet to your Kindle at . 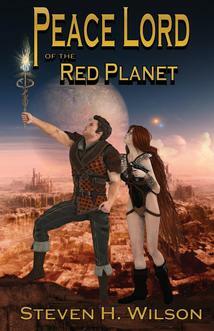 Peace Lord of the Red Planet has been sent successfully to your Kindle!